Most companies that use Canadian government funding approach the process by matching their project to one funding program. While this is a step in the right direction for many businesses (since only half of companies use grants and loans), it’s also a missed opportunity to leverage even more funding for their project. “Stacking” multiple funding programs takes great project management and funding expertise, but its benefits are well worth the work. Stacking government funding implies using both federal and provincial programs to offset a greater portion of eligible project expenses. Stacking limits and rules may change from one funding source to the next, so it’s important to understand the parameters of the programs you’re interested in. Most funding program guidelines clearly indicate if and how stacking can be applied; potential applicants should carefully review these rules and each program’s unique application process to navigate the process efficiently. As it relates to Canadian government funding programs, stacking involves accessing more than one grant or loan to cover a single project. Some basic rules govern this strategy to ensure the government is spreading its financial support to as many companies and projects as possible, but as a practice, stacking is absolutely permitted. As an example of stacking, automotive manufacturer Linamar was awarded $99 million in early 2018 between two government funding programs, the Jobs and Prosperity Fund (JPF) and the Strategic Innovation Fund (SIF). Each of these programs provide government grants to support large-scale capital investments that result in more innovative, productive companies. By leveraging both programs, Linamar received significantly more than it would have from either of the two programs alone. Seinfeld fans have another definition of double-dipping. However, when it comes to funding, it’s quite beneficial. Although stacking is permitted for most government grants and loans, there are a couple of general rules that companies must follow. Deviating from these rules can result in the rejection of one or more funding applications, so it’s critical to observe and abide by these concepts. Generally, stacking only allows for one federal and one provincial program to be used for the same project activities. Stacking two federal or two provincial funding programs is not typically allowable, unless projects are divided into well-organized sub-projects or “phases” that focus on seperate activities and expenses. Programs often stipulate a maximum allowable government funding contribution (typically 75% of total project costs). Companies should plan for how they expect to receive that upper limit since the combined contributions of two programs can easily exceed this maximum. Some programs prioritize the approval of applications requesting less than the maximum contribution, so structuring these grants and loans into your stacking strategy is advised. To stack government funding programs for your upcoming project, consider combining some of the federal programs mentioned in this section with grants and loans offered through your provincial government. When performing workforce development initiatives, consider leveraging both hiring and training grants. There are multiple programs available to support the hiring of students and recent post-secondary graduates. Since new hires may lack some of the skills sought by your company, consider stacking hiring funds with a training program such as the Canada Job Grant. Research and development projects that lead to new products or services have many opportunities to access Canadian government funding. We recommend using a phased approach to government funding programs that seeks funding for basic research, development and prototyping, and commercialization activities. Some programs well-suited for stacking include the Industrial Research Assistance Program (IRAP) and Build in Canada Innovation Program (BCIP). Productivity and growth-oriented projects often include several significant capital expenses, including infrastructure and equipment costs, that can be offset through Canadian government funding programs. The phased approach also works well for these types of projects. Establishing several smaller “stages” of the project and applying to a funding program for each stage can help to optimize the value of funding received. Some common business funding programs to support this area includes the Strategic Innovation Fund (SIF) and the Southwestern Ontario Development Fund (SWODF). Developing new export markets can take considerable time and resources. Fortunately, government funding can directly and indirectly support the costs of international expansion projects. These may include participating in international trade shows and developing research partnerships with foreign entities. Some programs to support these types of projects are CanExport and Going Global Innovation (GGI). 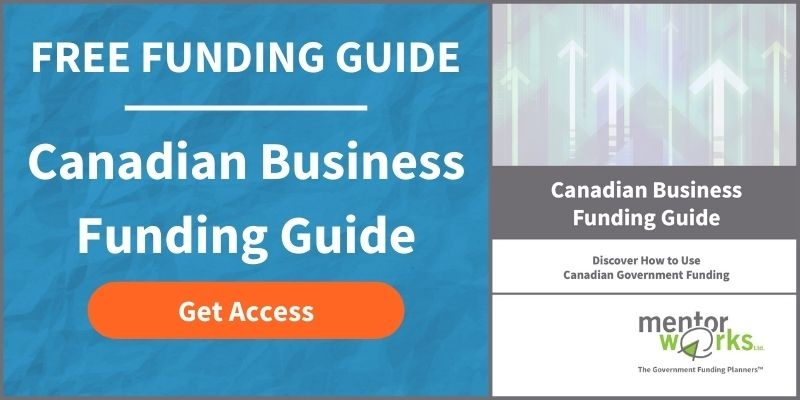 To explore more funding programs and application strategies, download the Canadian Small Business Funding Guide. Posted: August 13, 2013 by Anne Toner Fung. Updated: May 11, 2018 by Jeff Shepherd.